YES, Its been more than one year I am using both ad networks that's why Popads vs Popcash article idea come to my mind to write. Because there are numerous bloggers confused about Pop up ads, see ads networks are great for beginners for earning money without taking tension of selling products, so here I am giving my whole experience for you. So, here I come with another one dashing blog post. See, I have earn more than $932 ads networks in very short period of time, this happened because of only my experiments. Well, I have already written blog posts on these two networks on my blog with full details information, but in this blog post I will put my own experience. And one more thing please go through the link of this blog posts, if you are newbies to Pop up ads because those linked posts are most important too for newbies to know the real insight about Pop Up Ads. Daily Payment Request Applicable, the only these two networks have this option in the whole internet world. If you are looking for revenue then this is the best programs for you. Almost same for Popcash also. Yes of course, if your blog getting traffic from English speaking countries like USA, UK, Canada then chances of earning will be more. I will suggest you to try both networks and then decide with which one you would like to stay. See, only using these ads networks is not going to help you to earn more money, yes it is for sure your earning will be increase but you need to think on another thing also i.e. you need to think about traffic of your blog, that you need to increase traffic of your blog, if you wanted to earn more money in future. Recommended for Indian Bloggers- Google Adsense Alternatives for Indian Bloggers [I have earn over $2000]. These days even from last three years there are lot of changes we have seen in advertising industry and pop up ads networks are just amazing, because these ads networks are performing very well for publishers as well as for advertisers. Hello, guys how are you? There is no meaning to ask you this question after one complete comparison between two well know pop under ad networks in the whole world it is not saying by me only, but it the fact because these networks are really popular, even these networks got space in my Top ECPM Ad Networks list and that's great achievements of these two ad networks. I must say this, because after earning nearly $593 from popads [Till now I have update only $400 but next I will update this so stay tuned to see such update] and $120 from Popcash its really feel me awesome, because I have using long time Popads and Popcash its really little long time, but I am sure in future I am going to earn more from both the networks & I will keep updating you. But, if you are looking for earning more then you need fast loading hosting service, because I have seen most of the bloggers host their blog on slow loading hosting service, I don't know the reason may be price matter for them. But, after long research I have found two companies those are really awesome for bloggers to buy hosting from them and of course I am giving coupon code for getting maximum discount, you know why? And if you wanted to know more about earn money from blog, then I will suggest you to one of my article- Monetize Your Blog Smart Way. That's a right question dear, I am sure you are in the situation, so let me give you one suggestion to find out the best network for your blog. Just do one thing use both of them and stick to one later which one is performing the best, this concept I have used several times to identify the best ad network for my blog and succeed. 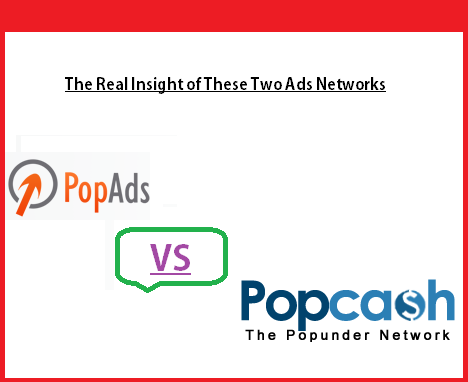 Hopefully you got the real insight about these two networks (Popads and Popcash), if you got any question then you can ask me below through comments. I know this is going to create little bit problem for your readers, but again here you and me both know if you want to get something you need to give something. But, this is also true, if you are giving right content to your readers, then it will not create much problem. i want use popads with popcash, are they accept? I used popcash for my blog. can i use any of them alongside adsense or would adsense ban me? At the beginning popads pays good. But when the visitor increases they decrease the ecpm. I am using it for 9 months. Now i make only 9-10$ /day. Still good not bad, hope it will resolve soon! Can you share how much traffic you are getting on your blog with popads to earn that much amount of money..I also use popads but i'm not earning that good. Hello, I have visited your blog and as per my blog traffic its really good about 5,000 visitors in a day from single blog and I have many blogs, I have suggestion for you get a domain name for your blog. thanks for sharing popads versus popcash.I have just join popads for my several blogs. Great share your results with me, it will be very helpful for others. How you can say Popcash is better than popads, have experienced both, share if you have any case study, it will better for others too.